You guys know those postcards with the witty sayings on them that have kind of come and gone as a trend? Well, like you, I've started just scrolling by them on Facebook or on blogs because if you've read one, you've read them all. That was until I saw the one to your right show up on my news feed. I love it for a number of reasons. It was obviously created by another photographer. It so beautifully illustrates one of the biggest questions we as a photographers field when presenting our services to a client, "Do I get all of the pictures on a CD? ", and why most established photographers respond with a polite "No, sorry." I understand why you want the CD. You want to plaster them all over your blog and Facebook, e-mail them to your mother in law to show her how happy her son is (despite the fact you can't make her green beans as good as she can), put them in your digital scrapbooks, etc. I know the real reason, however, is that you want to avoid purchasing prints from me because Costco will print them for you at less than half the cost of a professional print. Why would someone pay $15 for an 8×10 when Wal-Mart only charges $3.50? Well, I certainly wouldn't have written this post if I didn't have an explanation for you! • I spend hours upon hours crafting each of your images. From making the colors pop, editing out things that shouldn't be there and my goal is to make make you and every one of your images look their best. A professional printer is going to print test print after test print to assure that what I see on my screen is what you get in the mail. No funky color hues, no flat or muddy colors - exactly what you see on your screen, every time. • What happens when you go to Costco to pick up your pictures and you realize they've goofed up the colors, it's cropped funny or it's just not the image that you paid me for? The teenager behind the counter will probably just shrug your shoulders and tell you that he's not sure what to do for you. If that happens with my product, I make sure we find the issue, correct it, and rush order it to you at no additional cost to you in any way. This is my name and my product - I'll make sure it's right and that you're happy. • If you invest hundreds of dollars into your session, why wouldn't you invest in the final product? Think of it this way, or in a way you can someday rationalize to your husband when you tell him you want to spend $300 on prints from your session. Let's say you give him the go-ahead to convert a space in the basement for a theater. You get 8 top of the line seats with cup holders, reclining chairs and heated blankets. An impressive wall display for your movies and speakers made of the finest Brazillian oak. You line the walls with sound proofing foam and put fresh paint on the baseboards - and then you buy a 22" flat screen TV for your "theater". Um, what? 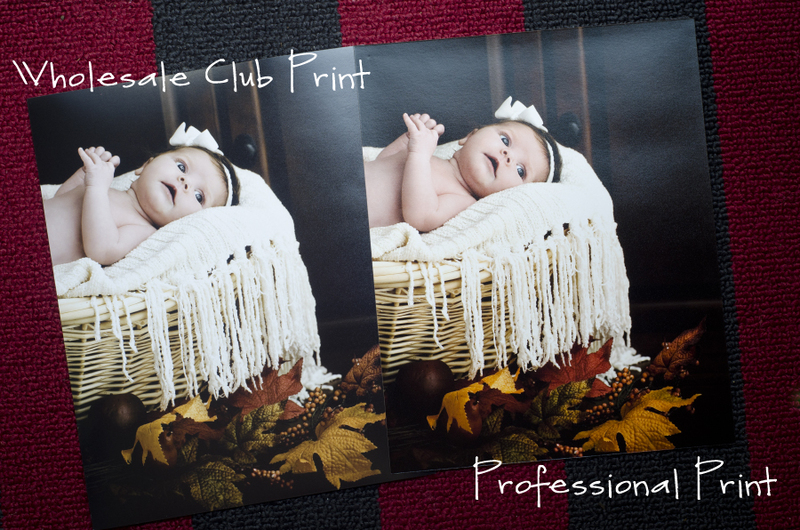 • Lastly, just the facts - professional quality ink and paper is a better product. It's thicker, more sustainable over time and an invest for the long term. 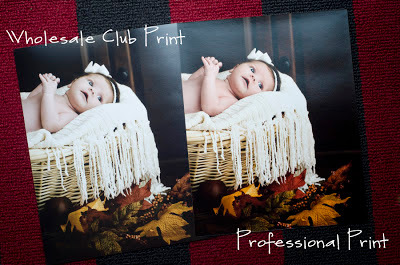 I've been just as guilty of getting professional images done and letting them sit on a CD way too long. I spent all of that time preparing for the session, finding just the right outfits and then just letting the pictures gather dust as files on a CD. I was forgetting to plaster the images all over my walls where I see them everyday. It can be tough to decide what to do with your images or how to display them once you've invested in great prints, so I've got a few ideas. 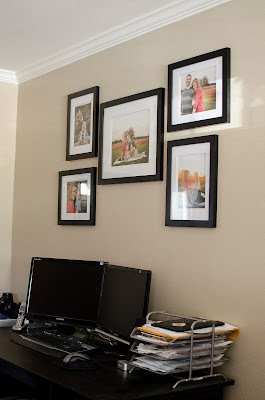 The gallery wall has become insanely popular over the past few years. 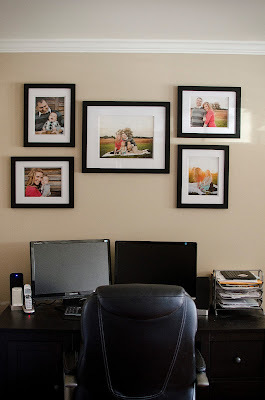 If you log onto Pinterest you can find a million templates to help you arrange your frames on the wall. Whether it's matching, matted frames like the ones above my office desk or multi-colored wooden and metal frames you've thrifted. Find a space you love in your home that you see often, find a template that suits your style and have at it! One of the best things about buying canvas is that the hard part is done. You have a three dimensional piece for the wall and it's ready to hang. No need to hunt for a frame and a canvas will match the decor of every room. 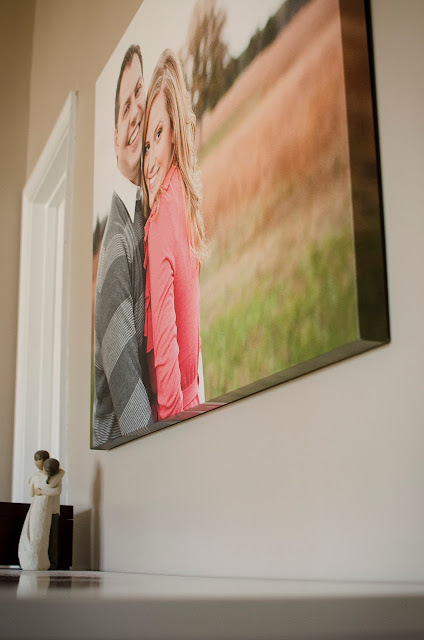 Big or small, a canvas makes a statement. The pictured canvas is 30x40 inches. It's huge! But so is the space in the room. My bedroom has tall cathedral ceilings and I tried a gallery wall here and it was just dwarfed by the size of the room. This canvas however make a huge impact. It fits right in with the proportions of the furniture and the corresponding architecture of the room. I'm sure I stole this off a movie or a TV show that I love. Maybe out of a Real Simple magazine? I just remember seeing every surface covered in frames with random pictures in it. Whether it was the piano, the sofa table, a side table in the family room - it was covered in frames. It felt so "homey" and I love being able to look at and see these photos often. They're not always full of professional pictures - sometimes they're of snapshots I've taken of the kids, places we've gone on vacation or old pictures from our wedding I'll throw in there for fun. Having a collection like this enables you to show off the photos from your session that don't really belong on the mantle or as one of your most prominent pictures on the wall, but they reflect your personality or your family in the moment. This ledge display is one of the very first places I put photos when we bought our home 3 years ago. This display is proudly on the red wall of my kitchen. Red just so happens to be my favorite decor color... Maybe it's the redhead in me? Anyway, ledges are all the rage right now. On pinterest there are all sorts of DIY ways to build them yourself and even I pondered that option for a while. That was before I realized how close I live to IKEA. (Ikea is a GREAT place for inexpensive frame options as well!) These ledges are less than $20. You do have to provide your own screws since they can't predict every surface you'll hang them on, but they are a sinch to put up. 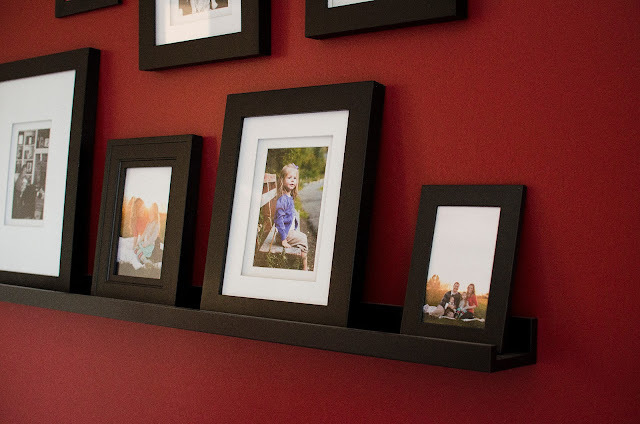 When the changed up the photos on the ledge, it was easy to reorganize and redistribute the balance of the frames since maybe the orientation of the image reversed. No adding of holes to the wall and it was a simple fix. I love how much dimension and interest frames and ledges give to the wall. This post isn't meant to sell you on buying from me. This post is directed at anyone who invests in professional photography. The whole reason I got into photography is because I love the photos displayed in my home. It's what keeps me calm throughout the day. It puts me in a better mood. You never know what could happen tomorrow and I'm grateful I have any pictures - professional or snapshot - of the people I love. 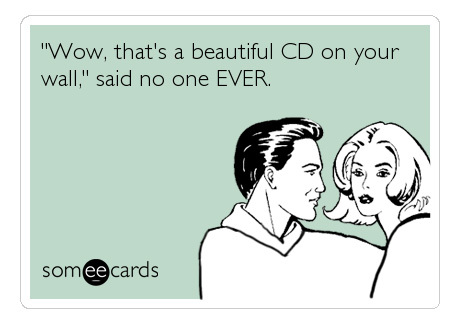 Don't get stuck on the CD and let it sit in your drawer or just on Facebook. 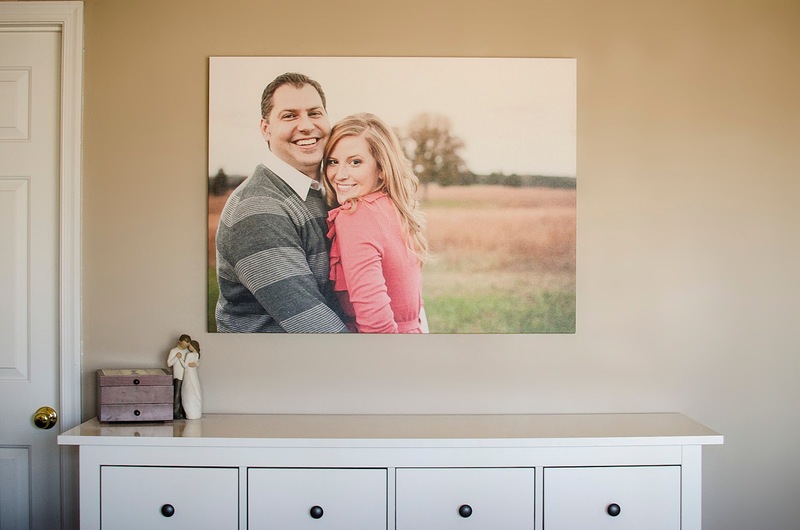 I can't think of a better way to decorate your home than with images of the people that matter to you most or of the events that made you who you are today. Big or small, there's a spot in your home for every image.